At Spixworth Infant school we aim to be a school where children’s rights are at the heart of our ethos and culture, to improve well-being and to develop every child’s talents and abilities to their full potential. 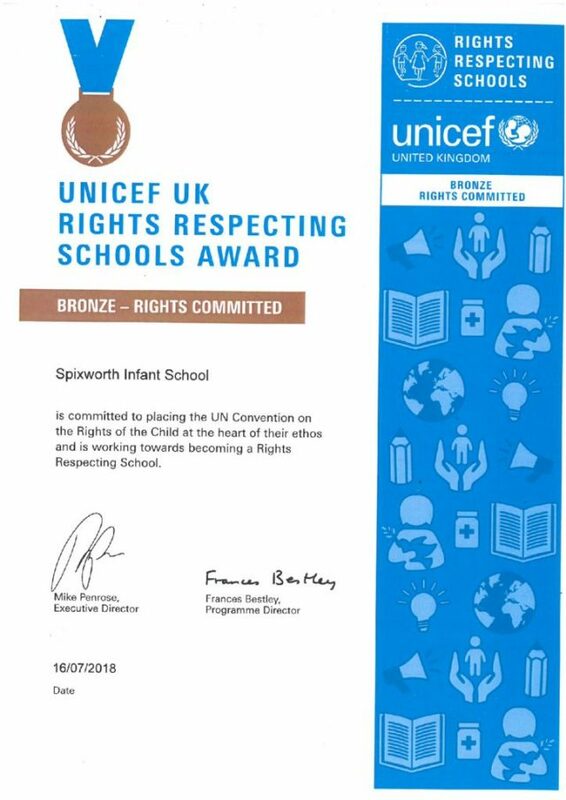 As part of this plan we are continuing to work towards recognition as a ‘Rights Respecting School’, an award given to schools on behalf of Unicef UK. Spixworth Infant school pupils will learn about their rights by putting them into practice every day. A Rights Respecting School models rights and respect in all its relationships. How are we a RRS? In every class we teach children about their rights, children are given the opportunities to share their own opinions, take part in discussions and value every ones ideas. Every year, each class makes a class charter. This charter is agreed and signed by the children and the teacher; it details what their rights and responsibilities in school are. At Spixworth Infant School we believe children have a voice, our School Council are our RRSA representatives and help us develop as a Rights Respecting school. The School Council meet regularly to discuss different articles, to raise money for Charity and to be our Rights Respecting ambassadors for the School. At Spixworth Infant we have taken positive steps in order to empower children to talk about their feelings, worries. Children begin to manage their emotions from an early age. Child whispering has been successfully implemented and used throughout every class, with individual children having access to ‘colour-o-meters’ to show the ‘colour’ they are feeling – particularly useful for our youngest children and those who find discussing their feelings challenging. Now that we have been awarded the Bronze – Rights Committed Award, the next step is to work towards achieving the Silver – Rights Aware Award. We really hope that you will be able to support our school on our journey towards Silver and a Unicef UK Rights Respecting School. You can find out a bit more about the Convention on the Rights of the Child by visiting unicef.org.uk/crc. It is an exciting time in the life of Spixworth Infant School. We have embarked on a journey which will benefit the whole school community, from pupils and staff to parents and governors. Here’s what we think you might like to know about it! Unicef is the world’s leading organisation for children and young people, promoting the rights and wellbeing of every child, in everything they do. Together with their partners, Unicef works in 190 countries to translate that commitment into practical action.